For the first nine months of 2018/19 (April – December 2018), Alstom received orders valuated at EUR 10.5 billion, with Europe having a contribution of 59%, followed by Americas (19%) and Asia/Pacific and Middle East/Africa, with a contribution of 11% each. During April – December 2018, the sales amounted to EUR 6.0 billion, up 16% (18% organically) compared to the first nine months of 2017/18. By sales’ destinations, Europe had the biggest contribution (50%), followed by Middle East/Africa (21%), Americas (18%) and Asia/Pacific (11%). By product breakdown, first nine months of 2018/19, the rolling stock has the largest portion (52%) in Alstom’s orders, followed by services (27%), systems (12%) and signaling (9%). With orders intake of EUR 10.5 billion, Alstom is reaching a new record-breaking backlog of EUR 40 billion. “Alstom achieved a continuous strong commercial performance this quarter with a new record-breaking backlog, particularly in services with notably the award of the maintenance contract for the Riyadh Metro. Sales were fully in line with our objectives that are confirmed,” said Henri Poupart-Lafarge, the CEO of Alstom. Over the third quarter 2018/19 (October – December 2018), Alstom booked EUR 3.4 billion of orders, compared to EUR 1.7 billion over the same period last fiscal year. The orders included “notably” contracts for maintenance of the Riyadh metro, regional trains in Luxembourg and Germany, and the signalling of Mumbai metro line 3. In the same period, company’s sales increased to EUR 2 billion, up 10% compared to EUR 1.8 billion over the third quarter 2017/18. 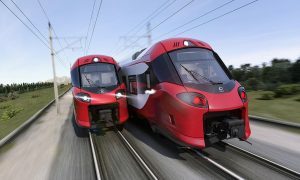 The sales’ increase was driven by progress in the Dubai metro system project, deliveries of regional trains in Europe, as well as maintenance contract execution in the United Kingdom. Alstom expects that for the fiscal year 2018/19, sales will reach around EUR 8 billion and adjusted EBIT margin should reach around 7%. In the medium term, Alstom should continue to outperform the market growth, gradually improve profitability, and improve cash generation, with possible volatility over some short periods.